Sediments reveal evidence of massive Mississippian flood around 1200 C.E. 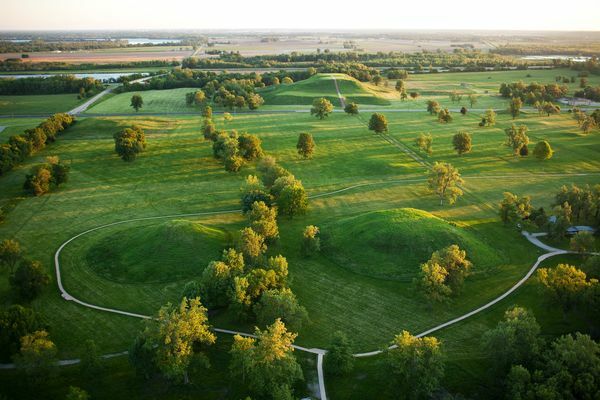 One thousand years ago, on a floodplain of the Mississippi River near modern-day St. Louis, the massive Native American city known today as Cahokia sprang suddenly into existence. Three hundred years later it was virtually deserted. The reasons for Cahokia's quick emergence and precipitous decline have been among the greatest mysteries in American prehistory, but new research suggests a possible cause of the city's demise: a catastrophic flood. A team led by Samuel E. Munoz, a doctoral student at the University of Wisconsin, Madison, reported at the 2013 conference of the Geological Society of America that their study of sediment cores from a lake adjacent to the site of Cahokia reveals calamitous flooding of the area around 1200 C.E., just as the city was reaching its apex of population and power. While analyzing cores from Horseshoe Lake, an oxbow lake that separated from the Mississippi River some 1,700 years ago, Munoz's team discovered a layer of silty clay 19 centimeters (7.5 inches) thick deposited by a massive ancient flood. It's unlikely that the ancient floodwaters were high enough to inundate the ten-story mound at Cahokia's center, a structure now called Monk's Mound. But a flood of such magnitude would have devastated croplands and residential areas, and may have made it impossible for a population numbering as many as 15,000 to continue inhabiting the area. Whether the flood caused Cahokia's decline and abandonment or simply contributed to it remains a subject for future research. But this much is clear: Within 150 years of the flood, what had been the largest prehistoric settlement north of Mexico became a ghost town, a vacant landscape of earthen mounds that would confound European settlers. Though the flood is a new wrinkle in Cahokia's story, other data from the team's research supports previous archaeological conclusions about the history of Cahokia and the Mississippian culture of which it was a part. Analysis of pollen deposits in the sediment cores from Horseshoe Lake shows an intensification of farming, accompanied by rapid deforestation, starting around 450 C.E., with corn cultivation peaking between 900 and 1200 C.E. Then the cores reveal the flood event, followed by a decline in corn cultivation. By 1350 C.E., the pollen record shows, agriculture there had essentially ceased. Munoz, a geographer who specializes in the study of pollen records, noticed that very little pollen research had been done in the American Southeast, where the Mississippian culture flourished. "And we didn't really have any studies outside big archaeological sites," he said. So when he saw Horseshoe Lake right next to Cahokia, he thought it was worth a shot. "These floodplain lakes have been ignored for a long time as sources of these kinds of records, and they can be really valuable," said Munoz, whose research was supported by a grant from the National Geographic Society. But he had no idea they might find such a big piece of the puzzle. "When we realized we were looking at a flood, and that it fell right at this key time in Cahokia's history, it was very exciting."